Our Nephrology Department is comprised of an experienced team of Nephrologists, Assistant Professor and junior resident.Full time running Dialysis facility providing round-the-clock care to dialysis patients.Eight Dialysis Machines, 1 CVVH machine, Two RO plants and Spacious Dialysis room.Dialysis Technician Course (diploma) affiliated to Kerala University of Health Sciences.Our Nephrology Department is fully equipped with a team of highly qualified and dedicated professionals to treat all types of kidney diseases. We provide comprehensive in-patient consultative services including critical care management. The department provides a full spectrum of evaluation of renal diseases with laboratory services, imaging studies and percutaneous renal biopsy. Our dialysis program provides quality service required for patients with acute renal failure and end stage renal disease at an affordable cost. 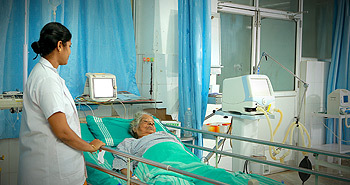 We offer CRRT and acute peritoneal dialysis support for critically ill patients in ICU. Treatment and evaluation of Acute Kidney Injury, Chronic Kidney Disease, Glomerular diseases, etc. Early Detection and Management of Diabetic Nephropathy.